Originally posted: June 2, 2018 . Last modified: April 16, 2019 . 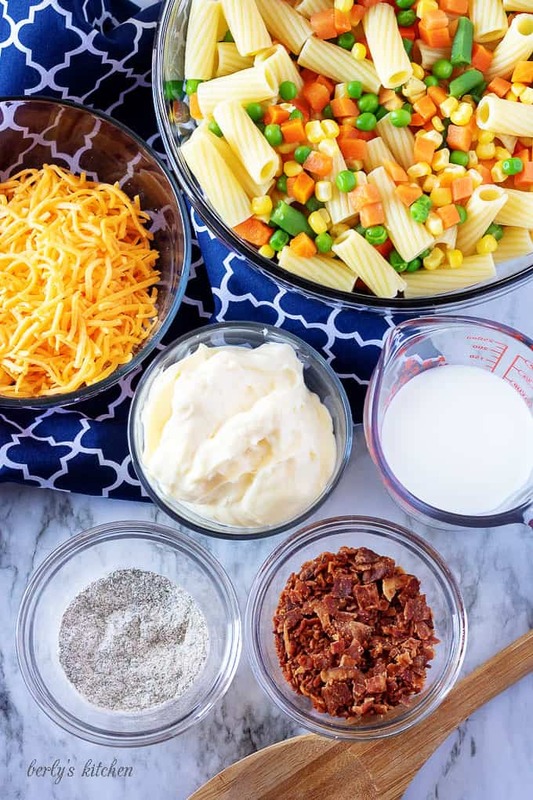 A fresh and easy cold pasta salad with vegetables made using just a few simple ingredients, including frozen vegetables and creamy homemade ranch dressing. Summer is almost here and Kim and I are so excited! We have a few recipes that are perfect for the warm temperatures. For this week, we’re starting with a cold pasta salad featuring mixed vegetables and homemade ranch dressing. The instructions seem a bit long, but trust me, it’s not nearly as complicated as it seems. 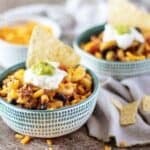 Plus, if you look at my tips section below, you’ll see some shortcuts that make this recipe even easier to prepare. Let’s get started! First, start by cooking your pasta per the box instructions. Once it’s cooked al dente, place it in an ice bath to stop the cooking process and cool the noodles. Next, cook the frozen pasta in boiling water in a medium saucepan for 5-7 minutes. Then drain the vegetables and add them to the ice bath with the cooked pasta. Now, cook the bacon, shred the cheese, and chop the crispy bacon slices into little pieces. Set them both aside in small bowls to be mixed later. Last, drain the pasta and vegetables and combine them in a large mixing bowl. First, in a medium mixing bowl, combine the mayo, milk, garlic powder, onion powder, salt, dill, black, pepper, and paprika. Use a whisk or fork to blend the ingredients until you have a smooth ranch dressing. Next, add the ranch, bacon, and cheese to the pasta noodles and vegetables. 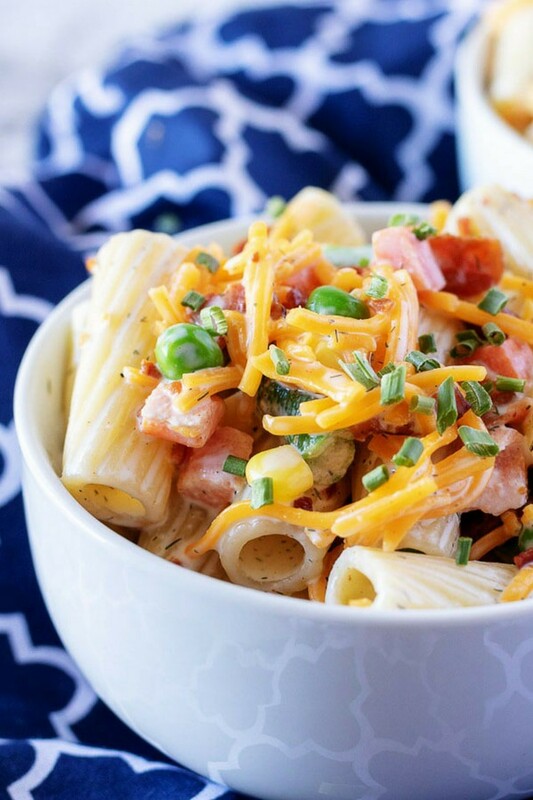 Last, use a large spoon to mix all the pasta, ranch, cheese, and bacon. 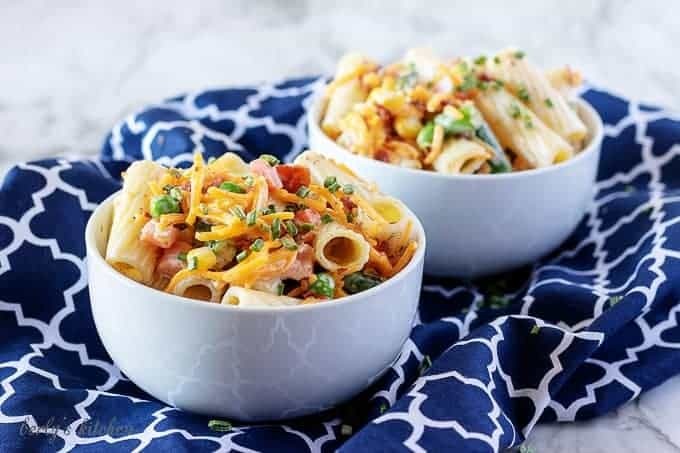 Refrigerate the pasta salad for about 30 minutes before serving. Garnish it with more cheese or diced green onions. No time to make your dressing, no worries, just use your favorite ranch dressing as a substitute and save some time in the kitchen. Feel free to use store-bought pre-cooked bacon and simple microwave it before chopping the bacon into bite-sized pieces. For an Asian inspired twist, use stir-fry vegetables, lo mein noodles, and an Asian sesame dressing! First, start by cooking your pasta per the box instructions. Once it's cooked al dente, place it in an ice bath to stop the cooking process and cool the noodles. The calories listed are an approximation based on the ingredients. Actual calories will vary. The cold pasta salad can be stored in your fridge for up to three days in a sealed container. 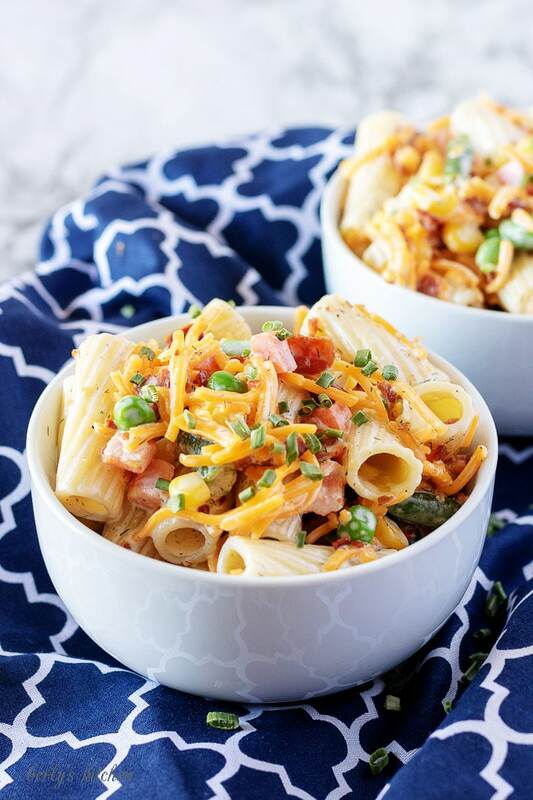 Pasta salads are a MUST for all the BBQ parties and picnics this summer. This sounds delicious. You can never go wrong serving salads like this. Always a crowd pleaser. I love pasta salads! The more vegetables, the better. I adore everything you put in here, especially the bacon! Yum! I can’t wait to make your delicious recipe! Looks SO delish! My mouth is watering! I love chilled pasta salads, especially with the addition of all the vegetables! And I love the asian flair in your tips section!! I’ll try that! BBQ season is also pasta salad season in our home. I’ll put your recipe on the list for our next BBQ party. I especially love the sound of that smoked paprika in the dressing. 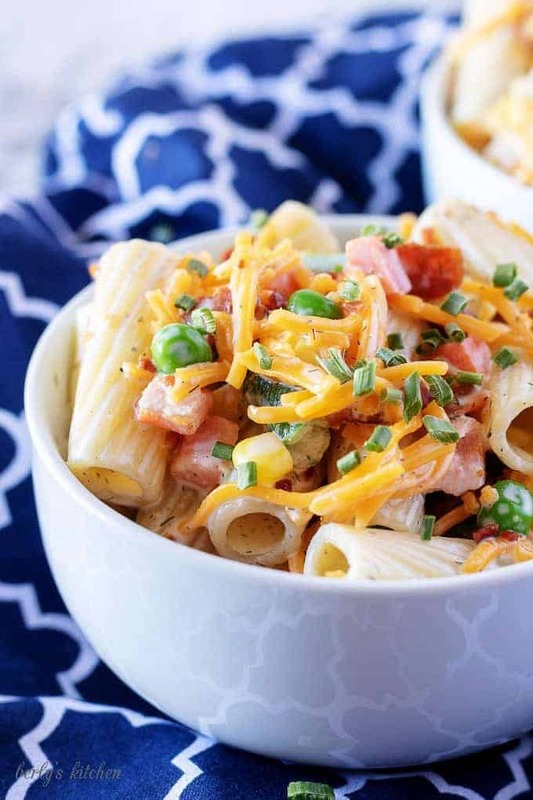 I swear, I practically live off of pasta salad during the summer – and if it’s got cheese in it, I am SOLD. 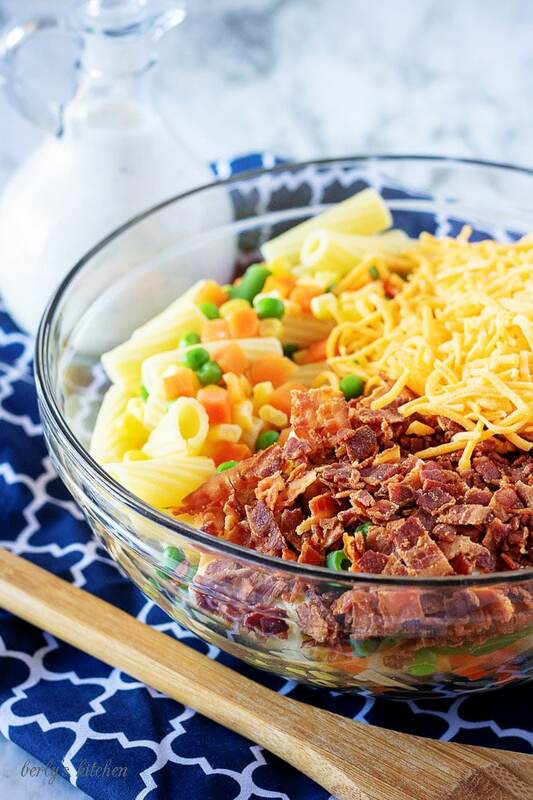 Pasta salads are always so cheerful and colorful! And so tasty!! 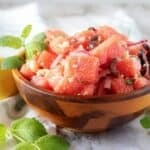 This one is just perfect for the summer temperatures we’re having! 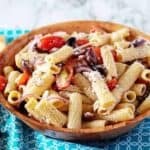 This is a great pasta salad recipe! Saving this one for cookouts this summer I’m sure everyone will love it. 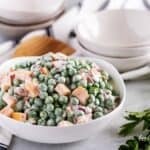 LOVE that you use frozen veggies in this salad. Perfect for summer. Ranch dressing is my favorite as well! 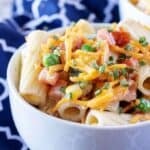 This looks like a tasty pasta salad! I will be making this real soon!